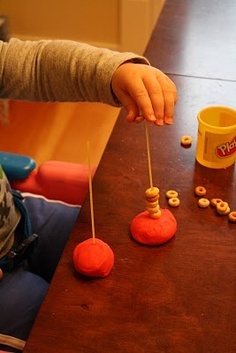 Fine Motor Practice, Cutting, pinching things like clothes pins, play dough, silly pudding, clay, putting beads together, spraying water bottles, using a hold punch, bubble wrap, squeezing tennis balls, foam balls, and using tweezers to pick items up. Instead of buying pages to have children practice cutting, you can make them, or have them make their own. It is more fun to cut what you made. The first one is a big sticky notepad from Office Depot. I hang it on the wall, and children start at the bottom dot and cut to the top. This allows children to stand and work. The second one has a clip at the top, letting the children know where to stop cutting. ALWAYS keep the cutting projects for their portfolio at the end of the year. You can really see progress from the beginning to the end of the year! These are actually shapes that were pre-cut from Hobby Lobby. 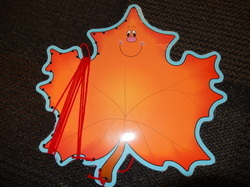 You can also use cut outs from your classroom, or die cuts. The pink balloon simply has black dots that the child must put a clothes pin on. The second one has numbers. You would say a number, or the child can roll a dice and find the number and put a clothes pin on the corresponding number. Use any old classroom materials, laminate, and make them into a lacing card! 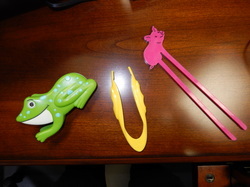 You can purchase pinchers that act as tweezers that are safe for young children. You can also use chopsticks. Children can practice holding large pieces of chalk in their hands and writing. The teacher can make shapes, numbers, and letters, and the child can use a spray bottle to spray the chalk. Get any can with a plastic lid. Punch holes in the lid, and put a colored hole saver over the hole. 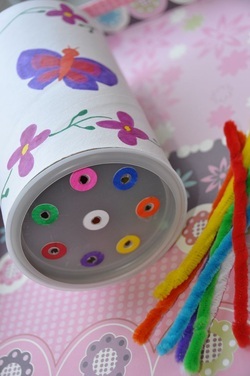 Get pipe cleaners that match the colors, children must sort, and use their fingers to push the pipe cleaners into the hole! What a great idea!